From the Gateway Arch to the Ozarks, as well as the confluence of the continent’s two biggest rivers, there is a lot to see in Missouri. Often, the best way to learn a little more and see things in more detail is to take a tour. Here are our favorite ways to see the sights in the Show Me State. One of the most breathtaking ways to take in the natural beauty of the Ozark region is to float through the hills and mountains on way of its famous waterways. KC’s on the Current, in Doniphan, helps you do just that. Take one of their float trips on the Current River and learn a little more about Missouri and the Ozark Mountains. In one of the state’s—and nation’s—more unique sightseeing tours, visitors to Fantastic Caverns will tour an underground (duh?) cave system in a Jeep-pulled tram. The caverns are lighted, so you’ll be able to enjoy the splendor of the system’s incredible stalactites and stalagmites as you go. A fantastic way to get acquainted with all the sights in the city of St. Louis is to hop on a trolley and take a St. Louis Fun Tour. 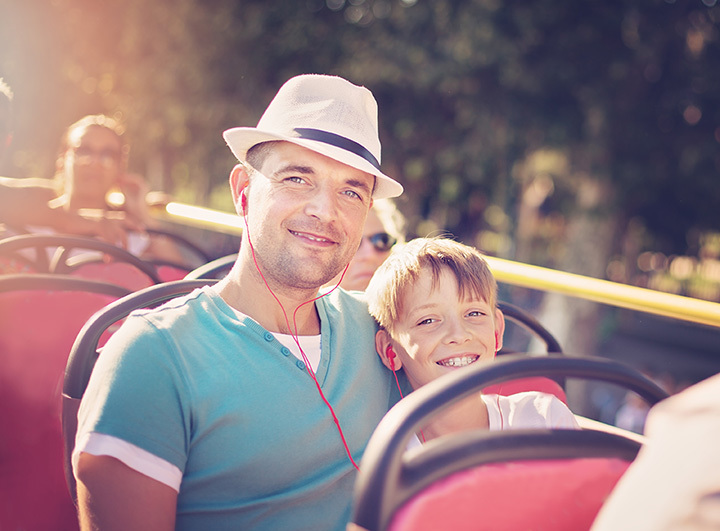 The fully-narrated tours only take 75 minutes, during which you’ll become familiar with all of the cities most historic and beautiful locations, from the St. Louis Arch to Busch Stadium. Listed as a National Historic Site and voted one of the top attractions in the U.S., Bonne Terre Mine is another place to see just how amazing Missouri is below ground. An abandoned mine, the site’s visitors can tour on foot, by boat, or by diving—Bonne Terre also happens to be the world’s largest freshwater diving resort. There is no better—or romantic—way to see the Kansas City riverfront than tucked next to your sweetheart in the hull of a gondola. Reserve your place with Ambiance on the water and let your gondolier ply the water of the Missouri River as you listen to the current rippling against the boat and take in the sights. Want to explore all the meanders and bluffs of North America’s longest river? Then head to Rocheport and book a spot with Might Mo Canoe Rental and Tours. You’ll paddle your canoe or kayak with a guide who will show you the Missouri River and central Missouri in the same way that Lewis and Clark saw them. If you’re interested in seeing how life was lived prior to the advent of 20th (and 21st) conveniences, take a trip to Jamesport. Visiting the area’s thriving Amish community is like stepping back in time. Start at the Jamesport Area Chamber of Commerce, and you’ll be led on a personalized tour to visit the shops, farms, and other sites that are important to preservation of the Amish culture in the 21st century. Perhaps the Show Me State’s most famous son, Mark Twain—Samuel Clemens, who took his pen name from a river depth sounding—was born in Hannibal. There, you can visit the author’s boyhood home and then take a tour of his beloved Mississippi on the Mark Twain Riverboat. Another awesome way to experience Missouri’s Ozark Mountains is to fly across them on a zipline—or navigate them on a ropes course or slide down them on a tube. You can do all three at Branson Zipline at Wolfe Mountain. For the tubing course, you don’t even have to wait for snow: They make their own. A great way to get to know Missouri’s biggest city is to tour it on a double-decker bus. And that’s just what KC Double Decker Sightseeing Tours does. You can hop and hop off from eight different locations, as you experience the sights, sounds (jazz! ), smells and tastes (barbecue!) that Kansas City has to offer.